Review: This film is set in the middle of the Napoleonic War. A British Captain decides to push his crew and ship to the limits. They are going in search for a French war vessel around South America. A must see!!! The best film that both of the actors have been in. 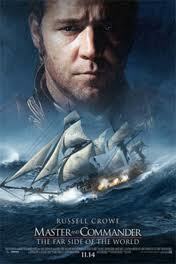 Russell Crowe had to learn to play the Violin and said that it is the hardest thing he has ever had do for a film. Over 90% of the film takes place on water. The only actor that didn’t get sea sick while filming is Paul Bettany. In 2004 it got two Oscars. They were for Best Cinematography and Best Sound Editing. It won 3 Baftas for Best Costume Design, Best Production Design and for Best Sound. This is on Barry Norman’s list of 100 Greatest Films of all time that he produced at the start of 2012 in the Radio Times.